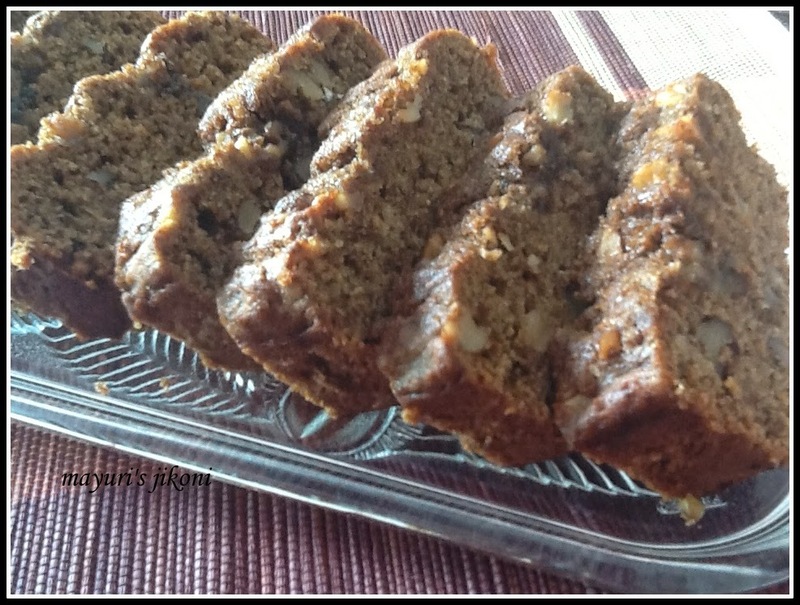 Last month Priya challenged the Home bakers Challenge group to quick breads. Carrot and zucchini, chocolate and an apple one. Chocolate and apple ones were struck off the list immediately as I have already baked those ones. So the choice was between the carrot zucchini one and the sweet potato one. Since I have not made many dishes using sweet potato I wanted to bake the sweet potato bread. Got all the ingredients ready and baked the bread. After one hour, the bread was still raw from inside. The top was beginning to brown too much. I covered with foil and lower the temperature slightly and baked it further for 15 minutes. The skewer came out clean, so I thought its all done. I let it cool for 1 hour. When I sliced it to take photos, much to my horror the texture was just too dense and it tasted as though I have steamed flour. Couldn’t even see a tiny hole in the texture. Felt so disappointed and left the bread in the kitchen and sat down to watch telly. Hubby dear knew immediately that something was wrong. He kept out of my way for a while. What was running through my mind was how am I going to rectify this problem. Couldn’t think of much. When Priya posted hers, I thought but the texture is still very dense, as she also rightly mentioned. What kept on niggling me was how come I was not able to bake a quick bread successfully. So going through other recipes began in earnest. I am so grateful for pinterest. I checked out the photos and checked out the recipes that appealed the most. Finally I came across one but it didn’t have the streusel on top. Finally I tried out the recipe yesterday. Kept my fingers crossed that it turns out good as I wanted to serve it today for my tea party. When I sliced it after cooling the loaf, I couldn’t stop grinning. Finally there was some good bread like texture. A bit of a victory jig and stored it away. The bread disappeared very quickly. Thank God I had saved a slice for hubby dear. Struesel is a crumbly crunchy dessert topping usually made from fat, flour and sugar. Some include nuts. Does throwing away food in the dustbin really bother you? Its really upsets me. Bake the sweet potato in the oven, steam it, or cook it in the microwave. Mix flax seed powder and 3 tbsp water and let it soak for at least 10 -15 minutes. Grease a 9 X 3½ ” loaf tin. Dust it with flour or line it with parchment paper. Sift flour, baking powder, baking soda, cinnamon and nutmeg powders together into a bowl. Take another bowl. Add sugar, oil, mashed sweet potato, orange juice, orange zest and the flax seed mixture. Add it to the flour mixture and mix till the dough is all wet. Pour the batter into the prepared tin. Level out the batter gently. To prepare the streusel, mix the butter, sugar and nuts. Sprinkle the streusel mixture over the batter. Lightly press it into the batter. Bake the bread for 30 minutes or till it is done. A skewer, toothpick or fork inserted in the middle of the loaf should come out clean. Let the loaf cool in the tin for 5 minutes. Carefully take the loaf out of the tin and let it cool on a wire rack. Serve as dessert, for breakfast or for tea. I baked the sweet potato in the oven. Wrapped it in foil and baked it at 180°C for 20 minutes or till done. Removed the skin and mashed it when the sweet potato was cool. I added walnuts as I didn’t have any pecans. Add which ever nuts you prefer. Take a loaf tin which is nearer to the measurement mentioned above. If you want to add an egg then add it along with the sugar and sweet potato and beat well. Omit water and add flax seed to the flour. Letting the flax seed powder and water soak for a while thickens the mixture and it gets the consistency of the white part of a raw egg. Lovely bread, now on Friday I have grren chana dish, u r not making that right? This is really a healthy one.. hubby also likes sweet potato.. I will make this for him. Bread looks so delicious.. I will try this out sometime..